Thanks guys! I've just downloaded. It's interesting that there's a lot of new tiles in Pelennor Fields, I wonder if that is After the Battle or if it's a newer version that is yet to be released. Still, it is probably far better than the old version of IRV. Does it at least allow filtering or sorting by image size? That would be the one feature that Odinson would be looking for since all of the terrain tiles are 200x200 images. Yep, it's very good at that. It also has a couple of bugs that I'm not very motivated to fix. You should probably check out AssetBrowser - I don't know what features it has, but it should at least let you see the set of valid image resources. It doesn't have a scan feature in it. The only images it knows about are the ones I found in my scan the last time I updated the plugin. I do keep it updated at major game updates, though. Cool! Thank you for the explanation! So you use IRV to scan for new tiles? How can I do the same? Well, as I explained, the version I now use is several versions newer than the one I published years ago - that one predated the Turbine bug fix for invalid image resources (around 3 years ago) which prevented it from effectively scanning for new images (I wouldn't even waste the time downloading that version if I were you). I don't have any time or motivation to consider refining and publishing the latest version, there's simply not enough interest to justify the time and effort required. How do you search new tiles with Terrain Map? Like how you searched the tiles of SA Blackroot Vale. The only legitimate way (without violating the EULA) is to use a Lua plugin to view all of the available resource files (there are many, many thousands at this point) and identify potential terrain tiles (over 26 thousand actual tiles at last check). Once you have identified which resources are tiles then you have to try to figure out where each tile fits in the world map. As the TerrainMap plugin description says, it's like a "26 thousand piece jigsaw puzzle where not all pieces are guaranteed to exist, some pieces are covered in crayon and others are duplicates" and the overall puzzle is an unknown irregular shape. That is why I wrote a couple of utility plugins for my own use to make identifying and organizing the resources a bit more manageable. I had previously published IRV, the Image Resource Viewer, but the published version is horribly out of date (may not even run anymore) and I haven't kept up maintenance on it enough to try publishing any of the newer versions - it's crude but works well for this one purpose, scanning for new resources and creating a list of all 200x200 pixel resources (the potential tiles). Once I have the current list of potential tiles I import that into another plugin, MapMaker which was written expressly to help manage tracking which tiles go where in which regions. Basically it is a series of grids where I can place tiles, either representing a region or a "scrap bin". Tiles that are totally blank and not in a sequence with other valid tiles go on the scrap region. The plugin also lets me flag a tile as a duplicate of another existing tile. That way, when a new release comes out all I have to concern myself with are the tiles that aren't already placed or flagged as duplicates. MapMaker also automatically cleans up any tiles that are no longer valid - i.e. they are no longer 200x200 images. MapMaker also assists in creating the pre-zoomed tiles as well as the regional overviews. Neither of those utilities will ever get published, mostly because they are quite ugly and unwieldy - they have obscurely or incorrectly labeled buttons for undocumented functions and in some cases require use of the debug window to call functions manually to crank them along - it would take far more time to clean up the UIs and make them suitable for anyone else to use than it would be worth - I run through a checklist on them once every 6 months or so (whenever new content comes out) and then forget about them for another 6 months. Last edited by Garan : 11-21-2017 at 07:03 PM. That's very interesting. Thank you! They have also updated a little bit of Ithilien since U21, like the mountain between Bãr Tarnaher and Cirith Negen. There's the big house for the hobbits as well as some trees and maybe some other stuff there. Also I would really like to see if the terrain map for Minas Tirith/Pelennor Fields during the coronation of Aragorn/the Wizard and the King instance. And are you able to see if there's new terrain in Northern Mirkwood to the west of Dale/Northeast of Grimbeorn's Lodge in the live servers? Sorry for asking so much, I am an explorer on LOTRO, I even managed to get out of Dale in the instance, but there's nothing that can be seen in the horizon that suggests a green land area anywhere near, although the place is so filled with trees that it's hard to tell. Last edited by Odinson : 11-21-2017 at 02:26 PM. 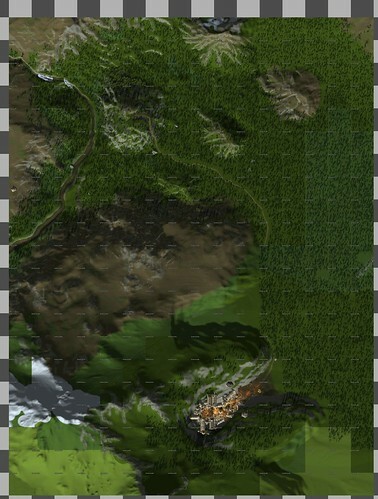 It appears in the Session Play "At the Stone of Erech", it is part of Region 2, you can even see a little bit of the area on terrain maps to the south of Kingstead/Helm's Deep. It is not the same blackroot vale from Region 3, it is Second Age Blackroot Vale. There is a city there called "Morthond", that doesn't exist in Third Age Blackroot Vale. Interesting. I'll have to run another character through that session play to see what it looks like. There are a number of small terrain areas that I've assembled but was never able to associate with a location in the game world so perhaps it will be one of those. EDIT: I believe you may be referring to Garth Lotheg, a Gondorian Fortress in Morthond. The coordinates however are a bit curious if we use the coordinates for the Stone of Erech from the session play and try to place the fotress relative to that location, it winds up covered by the start of a branch of a river so there's a small discrepancy in the terrain, not really unusual for a session play that the devs never expected to be placed relative to the rest of the game world, especially when the rest of the game world wasn't developed at that time. I'll look into it a bit more, but it's unlikely that it will fit at the location it is supposed to. EDIT2: Well, that explains a fairly large 16x21 tile segment that was on my 'scrap region' because I hadn't placed it in the world. It looks a lot different in the Region 2 version than the Region 3. I may still include it once I can verify the coordinates since it answers the question about where the session play takes place. It also gives an interesting reference point for lining up Region 2 maps with Region 3 maps since the Stone of Erech would now appear on each (despite the river missing from R2). FWIW, the "city" in question is indeed the fortress, Gath Lotheg. I'll post a zoomx2 version of the segment when I get a chance. EDIT3: Here's that segment slightly zoomed from my "scrap region" (with tile names superimposed because that's how my map maker plugin shows the tiles when I am working on a map). Click for larger image. Last edited by Garan : 11-14-2017 at 03:38 PM. Last edited by Odinson : 11-14-2017 at 12:16 PM. Do you know if there are new terrain maps for Northern Mirkwood in Rhovanion (Region 2)? By the way, are you also able to track the second age Blackroot Vale terrain map which is connected to the south of Kingstead in region 2? I would really like to see the location of that old city on that map. I don't publish or discuss anything that isn't on the live servers as that has a way of irking SSG. So Beta, even open Beta, stuff is off limits. I'm not aware of any second age Blackroot Vale terrain in region 2. All of the Blackroot Vale and even the Paths of the Dead are in region 3. Could you be more specific about the city in question? Is it something just seen on the horizon (in which case it probably doesn't exist in the actual terrain) or is it in an instance? Last edited by Odinson : 11-14-2017 at 06:17 AM. Can you search for a potential Region 5? There have been speculation that it could be Northern Mirkwood due to some hints dropped by SSG. If that's true... I would love to see the terrain map of it... It's probably only possible to see on beta right now. I can honestly say that I have not yet seen any terrain from a region 5 in Beta or live.